Simulators that generate observations based on theoretical models can be important tools for development, prediction, and assessment of signal processing algorithms. In order to design these simulators, painstaking effort is required to construct mathematical models according to their application. Complex models are sometimes necessary to represent a variety of real phenomena. In contrast, obtaining synthetic observations from generative models developed from real observations often require much less effort. 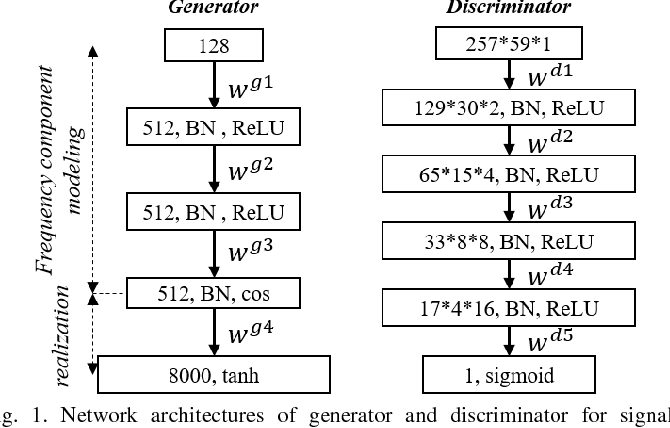 This paper proposes a generative model based on adversarial learning. Given that observations are typically signals composed of a linear combination of sinusoidal waves and random noises, sinusoidal wave generating networks are first designed based on an adversarial network. Audio waveform generation can then be performed using the proposed network. Several approaches to designing the objective function of the proposed network using adversarial learning are investigated experimentally. In addition, amphibian sound classification is performed using a convolutional neural network trained with real and synthetic sounds. Both qualitative and quantitative results show that the proposed generative model makes realistic signals and is very helpful for data augmentation and data analysis.